Courtesy of the Family Research Council. 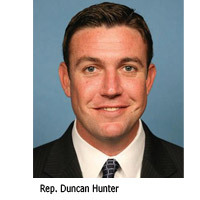 Just because President Obama says homosexuals can openly serve doesn't mean others can't openly object--not if Rep. Duncan Hunter (R-Calif.) can help it. Over the next two weeks, the fellow Marine veteran will be sprinting to beat the "Don't Ask, Don't Tell" repeal with a bill that would protect the troops' right to free speech. As far as Hunter is concerned, if he can't protect national security by stopping the repeal from taking effect, he can at least protect the right of conscience of the servicemen and women who are afraid their opposition to homosexuality will be used against them. Although the new policy doesn't take effect until September 20, Hunter and other conservatives are already fielding complaints from the branches about the Pentagon's progressive training materials. The California Congressmen says he's talked to dozens of active duty personnel, who say the Defense Department is "pushing the line" in its implementation of the new rules. "It is a legitimate concern," Hunter's office explained, especially as the Pentagon works on "disciplinary policies for people who don't agree with this decision." Under Hunter's bill, the troops have to abide by the repeal--but they don't have to like it. "The military always falls in line," a spokesman for the Congressman's office said, "but that doesn't mean that the men and women who serve in its ranks should suddenly be forced to personally accept [homosexuality]." Essentially, the legislation would ensure that "members of the Armed Forces are not pressured to approve of another person's sexual conduct if that sexual conduct is contrary to the personal principles of that member." These "conscience protections" would give our troops just as much right to voice their opinions as others have to flaunt their sexuality. With just 13 days to go before the military opens its arms to gays and lesbians, the time to push Hunter's bill is now. You can help by calling your members and encouraging them to cosponsor the legislation. Our troops promised to obey orders--not surrender principles.